Until recently, this vulnerability went unaddressed by Microsoft for versions of IIS after 6.0 and before 10.0. The majority of advice provided by online resources suggests applying the latest patches, but as patches don't exist for version 7.0 to 8.5, this isn't an option. The reason this is possible is because the HTTP 1.0 protocol doesn't require the Host header to be set by the client as part of a request. This is in contrast to HTTP 1.1, which requires the client to specify a host. Our recommended solution to this issue is to configure the IIS server to deny requests made without the Host header set. 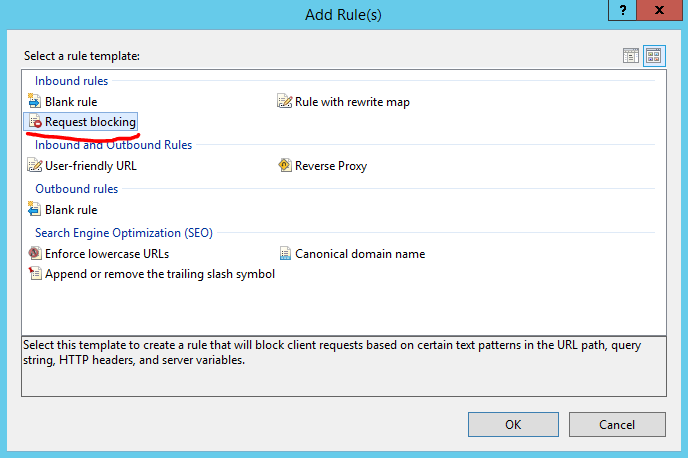 This can be achieved through the URL rewrite module for IIS (https://www.iis.net/downloads/microsoft/url-rewrite). Step 1: Open URL Rewrite in the application's control panel. As always, we strongly recommend thoroughly testing any changes made in your environment to ensure that business critical functionality is not interrupted as a result of any changes made.